We aim to relieve poverty, distress and homelessness and help homeless people rebuild their lives. WNSMK provides supervised overnight accommodation and meals to homeless and vulnerable people who would otherwise be rough sleeping in Milton Keynes during the coldest months of the year (November–March). We work in partnership with many churches and community centres across the city who provide their facilities as an overnight venue. In addition to essential shelter our staﬀ and trained volunteers provide welfare support. We enable our guests to access drug and alcohol support services, to obtain housing advice, move on to longer-term accommodation and to ﬁnd work. People arrive at the Winter Night Shelter for many reasons. They can be old or young, men and women. Some are long-term homeless, but many are the victims of circumstance. They may have deteriorating domestic issues; they may have lost jobs and no longer be able to pay for accommodation. 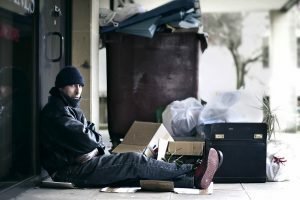 Illness, disability, mental health struggles, language barriers and lost or stolen identity documents can all play a part in someone ending up on the street. We help all those in need regardless of whether or not they have recourse to assistance from public funds. Could you give £3 or £5 a month? Small, regular donations help us to budget and plan. See our Donate page for details. Monetary donations are most useful to us; we are usually unable to accept unsolicited donations of goods or food. We operate an Amazon wishlist for anyone wanting to purchase practical items to be delivered to us, which helps keep our costs down. Thank you for supporting us in this way. Concerns can be referred to the Winter Night Shelter’s welfare team on 07549 609427 or by emailing welfare@winternightsheltermk.com. StreetLink is a nationwide project whereby members of the public can report incidences of observed rough sleeping and welfare concerns. Street Link will then alert the appropriate agencies to offer support. You can report a rough sleeper to Street Link via their website or calling 0300 500 0914.